This was an interesting week for several reasons. One is that I am getting used to the schedule and am not quite so tired by the end of the week! That is a relief. The still life setups are getting more complex but the process is getting easier. By process, I mean it is getting easier to spot my errors on my own, I catch more of them, and the technique comes easier. The act of drawing itself remains intense and challenging as I think it always will. 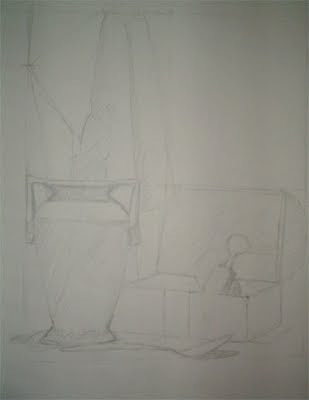 The picture above is of the still life we did in the Tuesday evening class. It was fun to have a more complex object to draw. The still life below was Thursday afternoon. I would have liked to add a lot more detail and shading but that is not the purpose of this exercise at this time. We are starting to have fabric drapery to draw too. The shapes become more abstract. 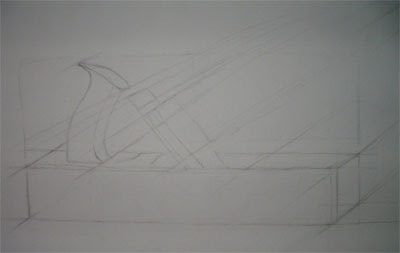 The final drawing I posted is from the construction drawing on Friday afternoon. A bit more challenging than the cube we drew the first time. I actually enjoyed this one even though it was pretty tough to get everything going right and still needs a bit more work. 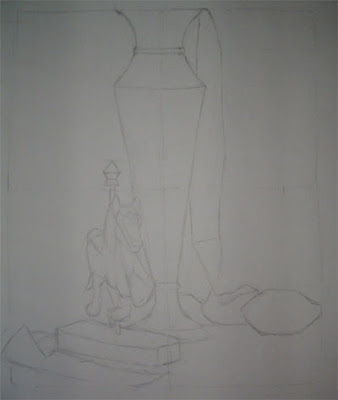 We draw the object visually first then add the perspective lines to do the minute corrections usually needed. It is really amazing how the drawing just snaps into place when the construction is added. Wow, Renee, how lucky you are to have all this drawing experience, but how intense! I'm surprised you aren't more tired than you seem. I remember how fast time flies when you are concentrating on a drawing. Thanks so much for sharing yours, and keep on going. Thanks for the encouragement everyone! I appreciate the comments.